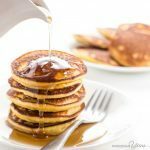 The best foolproof keto crepes recipe! 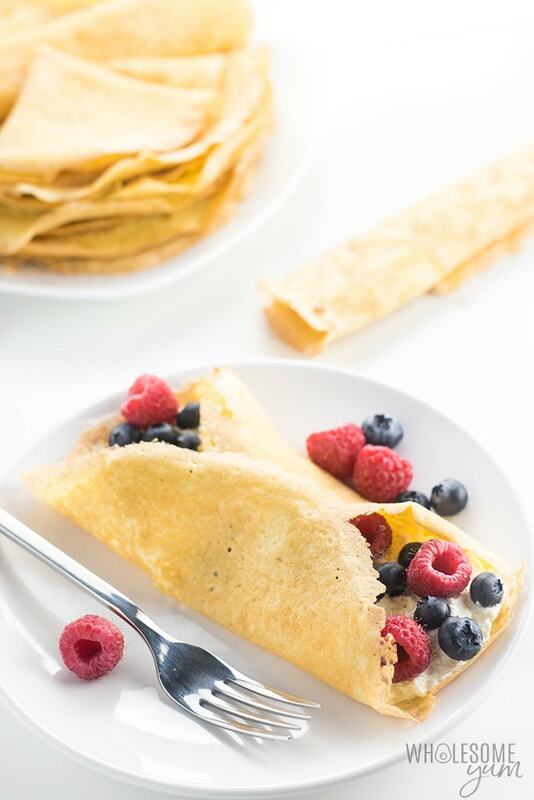 These paleo, gluten-free crepes with almond flour taste just like real ones, and they will bend, roll and fold without breaking. Options for sweet or savory! This post is sponsored by Vital Proteins. All opinions are my own and I only share products I personally love. Thanks for supporting the brands that make this site possible! It’s our wedding anniversary today! And, I’m making my husband’s favorite breakfast ever: keto crepes with almond flour! You can make these sweet or savory, but I’m opting for sweet with lots of berries and whipped cream. It took me some time to perfect this gluten-free crepe recipe into one that tastes authentic and doesn’t fall apart. It was so worth it. 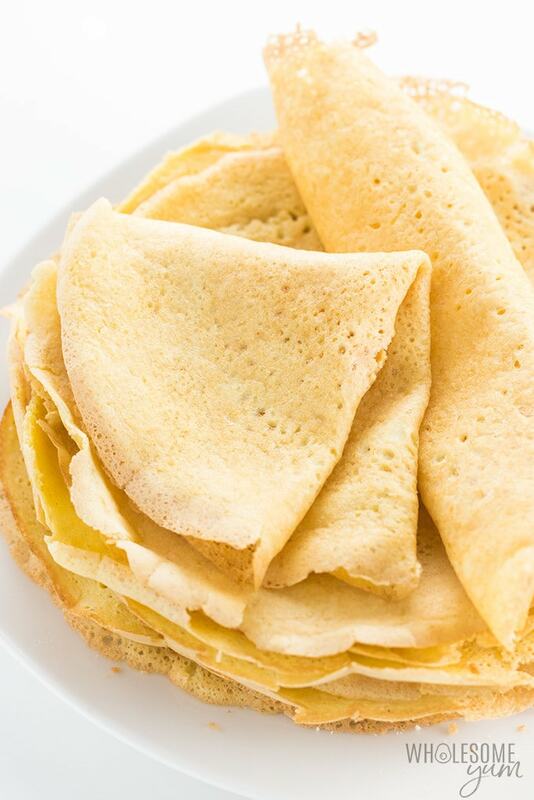 And, these almond flour crepes happen to be paleo and can be made dairy-free. 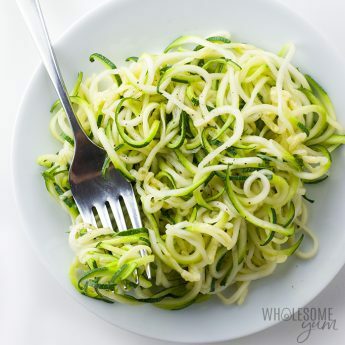 You can even enjoy them on the whole30 if you go for the unsweetened version. 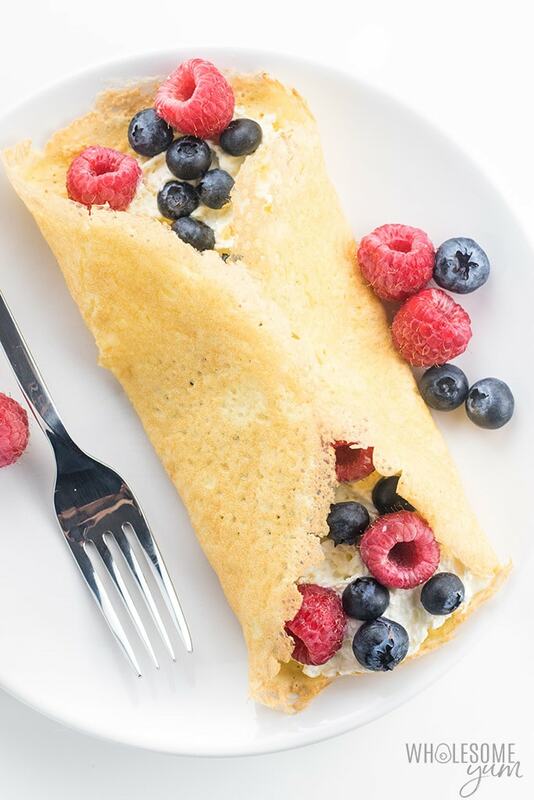 If you’re looking for almond flour crepes, that probably started with a search for either low carb or gluten-free crepes. People asking, “are crepes gluten-free?” will of course discover that the usual answer is no. But, can you make gluten-free crepes? Definitely! And I’ll show you how. One of the biggest challenges with making gluten-free crepes, especially if you also want keto crepes, is getting them to stay together. In regular crepes made using wheat flour, the gluten helps to bind them together. You can make them as thin as you want – they’ll still bend and fold. That’s not the case with many gluten-free flours, and virtually all low carb flours. So what do we do? 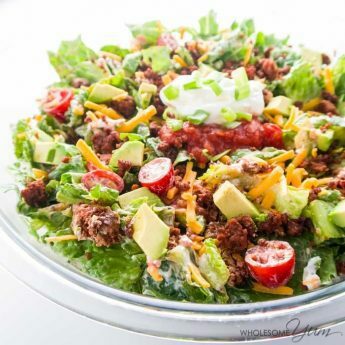 We add some Vital Proteins grass-fed beef gelatin! Its more common use is for sugar-free gummy bears, but it actually works great in making doughs and batters behave as they should. Not to mention you get the benefits of collagen from gelatin, too. I know gelatin might sound a little strange for crepes, but trust me, it works. 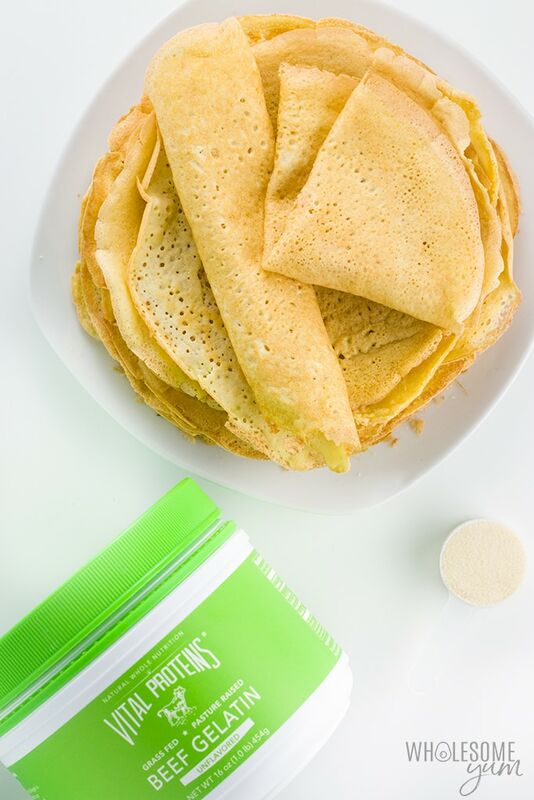 It acts as a binder, so these keto crepes will bend, roll and fold just like real ones! You won’t taste the difference, I promise. 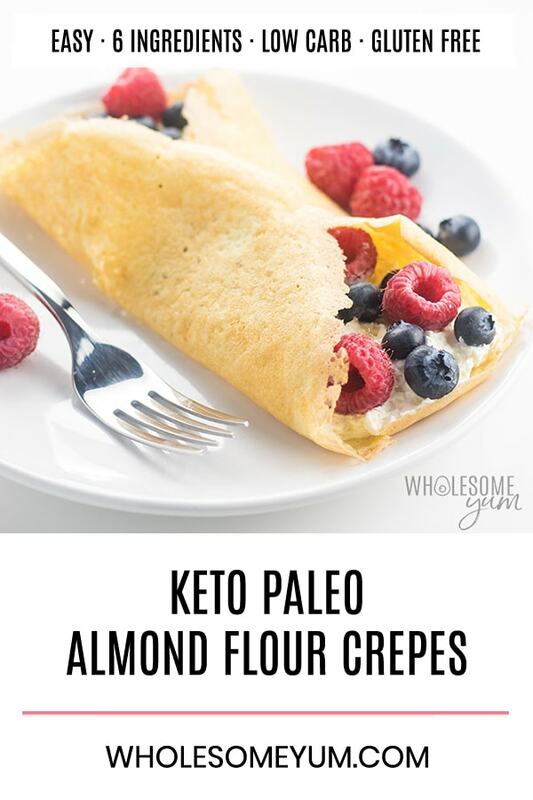 The process for how to make keto crepes with almond flour is really quick and easy. It’s not too different from making regular crepes. Except the first step. To start, we will “bloom” the grass-fed beef gelatin, which basically means mixing the powder with water. It will expand and thicken in a few minutes. While this is happening, combine the other ingredients in a blender – almond flour, sea salt, eggs, melted ghee, and some more water. You can use coconut oil if you want to be completely dairy-free. Puree the batter together until smooth, then add the thick gelatin mixture and blend again. The batter will be similar to normal crepe batter (runny), but can be just a tiny bit thicker. If it’s super thick, add a bit more water gradually to thin it out. No need to refrigerate the crepe batter. 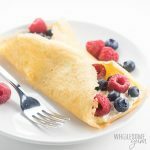 This is a common requirement for traditional crepes made with wheat flour, but you can skip it for these gluten-free crepes made with almond flour! The reason is, the need for refrigeration has to do with the interaction between gluten and water. 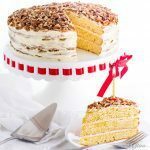 No gluten means no waiting required! Use the right size pan. An 8-inch pan works best. This recipe is more difficult if you try to use a larger one. Use a pan with a heavy bottom. It transfers and maintains heat better, translating to better crepes. Heat the pan gradually. If you heat the pan too fast, it will likely overheat, you’ll have to reduce the heat to compensate, then increase again. Instead, heat it over medium-low and be patient as it heats up. Make sure the pan is hot, but not too hot. I know that sounds confusing. What I mean is, heat the pan at medium-low (or sometimes medium), not higher, but give it enough time at this temperature to heat up before you begin cooking. If the pan is too cold, the crepe batter will stick. If it’s too hot, the crepes will be crispy instead of soft. Use just a little oil (or ghee), but not too much. You need enough fat to prevent sticking, but if you use too much, the almond flour crepes will crisp up. You need a very, very small amount, and only need to grease after every few crepes, not after each one. Swirl the batter around the pan correctly. I did this wrong for years and had no idea! Don’t tilt the pan one direction and wait for the batter to drip down to the edge. Instead, rapidly tilt in a circle in all directions, and repeat this quickly 2-3 times as soon as you pour the batter in. The circle of crepe batter will gradually get larger as you do this. Flip at the right time. Cook the crepe for 1-2 minutes, until the edges are dry and you see bubbles forming on top. Gently slide a turner underneath, and if it feels dry enough to stay together, then you can flip. You may need to adjust the temperature a bit as you go. Usually, all the crepes after the first one should turn out about the same if you have the temperature right. Cook for less time on the second side. After you flip, you usually need less time than the first side. No more than a minute most of the time. Fresh gluten-free crepes with almond flour are delicious, but you can also make them ahead of time. Store them in the fridge lined with parchment paper or paper towels between them. Make sure the container doesn’t have too much air, because they can dry out and become crispy instead of soft. If this happens, you can just break them apart and use them as chips! It was a surprising side effect I discovered. You can also store almond flour crepes in a plastic bag in the freezer. Again, line them with parchment paper in between first. 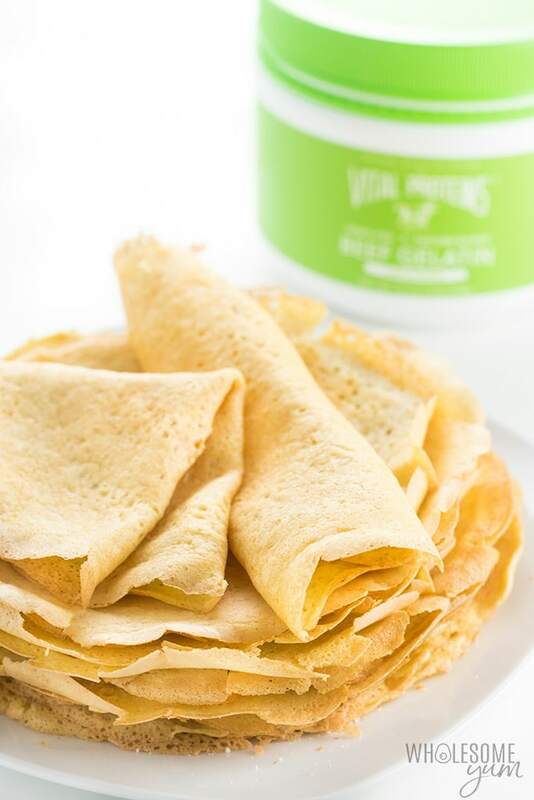 Now the only question is, do you like your keto crepes sweet or savory? The recipe card below gives you both options. If you make them, let me know what you filled them with! Place gelatin into a small bowl with 1/2 cup water. Set aside for 3 minutes to bloom. Meanwhile combine almond flour, sea salt, eggs, melted ghee or coconut oil, and remaining 1/2 cup water in a blender. Blend until smooth. Heat an 8-inch oiled pan over medium-low heat. 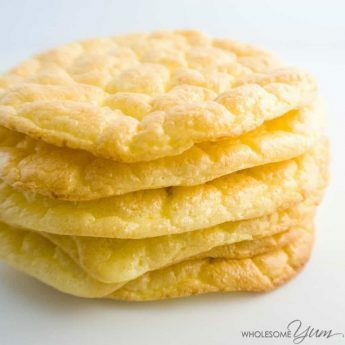 Pour 1/4 cup of batter into the pan and quickly tilt in a circle repeatedly, to spread evenly into a thin layer. (It may form empty air bubbles at first, just keep rotating and the batter will fill them in.) You should be able to get 2-3 rotations in. Cook for a minute or two, until the edges are dry, then carefully flip and cook for another minute on the other side. Click or tap on the image below to play the video. It's the easiest way to learn how to make Keto Crepes! Could you use almond butter mixed with coco powder for the filler? I haven’t tried the recipe yet, but I can’t wait to! Hi Linda, Sure, you can! Sounds delicious! Hi, do these taste eggy using the 4 eggs? Hi Caroline, No, I don’t think they taste eggy! Should you use cold or hot water to mix the gelatin? Hi Anita, Just room temperature water is fine. All of the Crepes fell apart. I even tried salvaging with an extra egg and they still fell apart. Hi Charlotte, Sorry to hear you had issues with the crepes. Did you watch the video? At what point did yours start to look different? Did you use the gelatin and let it bloom? I’m happy to help if you want to pinpoint what you might have done differently. Hi, Can I use collagen powder instead? Would it have the same effects? Hi Nilam, No, sorry, they will fall apart if you use collagen. You need gelatin for this recipe. OH! ALMOST lost for words…These are so sinful it doesn’t seem possible they are allowed on a keto low carb diet!! Definitely a winner!! I am so happy you liked them, Doreen! Thanks for stopping by! This is really good, works well, thanks! I am glad you enjoyed the crepes, Suzette! Have a great day! Maya, I have a question. Is it possible to just use regular gelatin? It says no carbs, nor sugar. 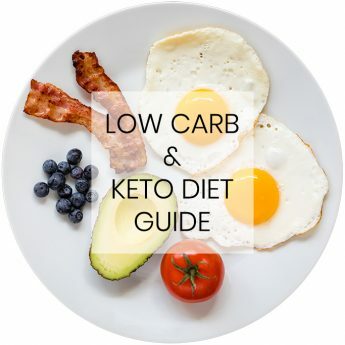 I’ve been on the keto way of living for about a month now, I’m still learning though! 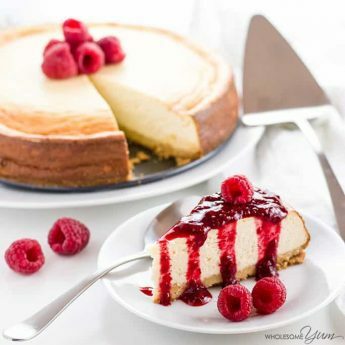 Thank You so much for the recipes! Excited to try a lot more of your great recipes! I have never bought anything online, I thought it was putting out to much information? Thank You! Hi Sharon, Yes, you can use regular gelatin. I just like the benefits of grass-fed gelatin. I hope you like the crepes! I buy things online all the time, and it’s safe as long as it’s a secure website you trust. The sources of my ingredients are linked from every recipe card. Oh, so good: light and delicious with whipped cream, raspberries and blueberries–just like in the photo. 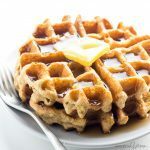 I did learn a few things: this recipe works best with our cast iron pan at almost the lowest temperature as it holds the heat well. (At first I tried a heavy steel pan, but I think the temperature varied too much, and I was still learning the best setting.) I used a very little ghee before each scoop of batter, which worked for me. I served this for my hubby’s 60th and his parents who came to celebrate. My mother-in-law is celiac, so this was the best treat for all of us! Thanks so much, Maya! I am so happy to hear that, Florence! Thanks for sharing with us! Great recipe that worked perfectly.I am a type 2 diabetic and missed crepes very much. My wife who is on Keto diet enjoyed them with me. I used plain gelatine sachets found In pantry which worked well. I also grind my Almond flour from Almond with skin on costing less than half the price of store bought flour. Thanks very much David. Thanks for sharing those tips with us, David! I ma so happy you liked it! Thank you, Rekha! For this recipe the gelatin is pretty imperative – it holds the crepes together. You could try a little xanthan gum (you’d need much less, maybe 1/4 to 1/2 tsp) to see if that helps; if you do, you’d want to omit or reduce the water also. I haven’t tried it though so can’t vouch for it for sure. Happy Anniversary! Ours was yesterday, June 10 – 46 years. I’m excited to try this crepe recipe. After all these years, digestive systems have changed a bit and I’m doing my best to avoid wheat. Happy Anniversary, Barb! I hope you’ll love them. 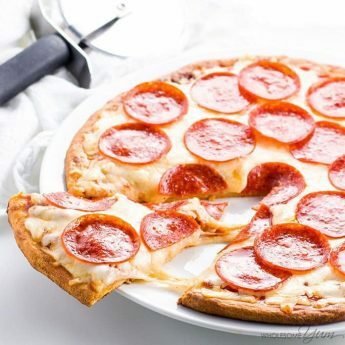 Hi, how about use coconut flour instead of almond flour? And can I add some xylitol? Thanks, you’re great! Hi Monica, Coconut flour would not work, these need almond flour. You can definitely add xylitol though! Hi Maya, can I use normal beef gelatin? I don’t want to buy the brand you have because I have a 500g container of the normal gelatin. Hi Wanda, Yes, you can as long as it’s powdered gelatin. Can you use regular gelatin in place of the Vital grass fed? Hi Kathleen, Yes, you can. The one linked in the recipe is just my favorite kind. Can these be used to make manicotti? Hi Ann, Yes, you could definitely do that! AMAZING…!!! 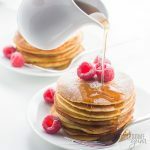 Great tips to cook perfect gluten free crepes, you make it seem so easy … I’ll have to verify if it’s really foolproof if I’ll get success with this yummy recipe 😉 And I like the idea of using gelatin to give texture, I’ll try this new option as soon as possible, thank you for sharing! Thank you so much, Roberta! Can’t wait to hear how they go for you.